It's never too early to unleash a child's inner Picasso, especially on a rainy afternoon when a meltdown is just a bored whine away. 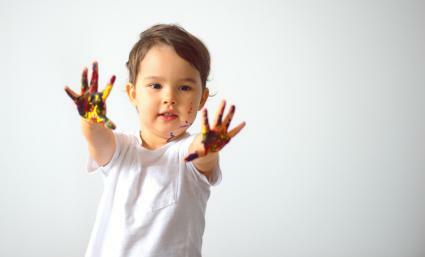 From about 18 months to 3 years old, kids can make an artful mess to help you decorate your house. What could be more fun than coloring an outline of your feet on a giant piece of paper? This project takes an initial tracing and cutting out by a parent, but the "fabulous" part is pure kid. Pasting a trail of those decorated footprints to a secret location is almost as fun as following that trail, one dainty tip-toe after another. Making these fabulous footsies is suitable for toddlers ages 2 to 3 years. Have the child stand on the paper. Trace around both feet with a crayon or marker. Repeat steps 1 and 2 to make lots of footprints. Using painter's tape, secure the paper to a table or flat surface and let the child color her feet. Encourage older kids to draw and "paint" toenails. Cut out the feet and tape them to the floor with a piece of folded painter's tape under each footprint. Make a path to the table, fridge or nursery. Cute craft tape creates an imaginative trunk and branches for a tree about to spring into leaf. Get crazy with patterns and colors for the tree and use several art techniques for the leaves. These trees are suitable for kids ages 2 and up. Make one tree trunk with branches, per child, on the paper using one or more colors of washi tape. Ask the artists for suggestions. Gather small leaves from plants in the yard or a nearby park. Set bare tree forms on a flat, protected surface. Open non-toxic stamp pads and show kids how to stamp their thumbs in the ink and then on the branches to make leaves. If your tree forms are large enough, kids can use entire handprints for some of the leaf clusters. Press small leaves on the ink pads and print them on the tree. Glue a couple of real leaves to the tree, or falling from it, and let the print dry. Younger artists still tend to taste first and ask later, so yuck-proof your project by making yogurt paints. Yummy yogurt painting is safe for 18 months and up. Trace and cut out a cookie cutter shape in a piece of card stock, using a craft knife or scissors. Cover a table with paper and place two or more small dishes of plain vanilla yogurt in front of each child. Set a bag in front of each child. Let the kids fingerpaint one side of the bag with the yogurt. Model one-finger design-making and monitor excessive blobs. The "paint" shouldn't be a pudding-thick layer on the bag. Open each bag carefully while it is still wet, stuff the open bag with crumpled scrap paper or newsprint to stabilize them, and set the open bags aside to dry. 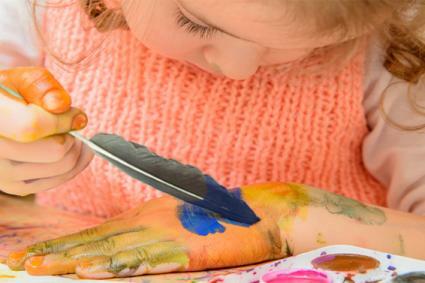 You have a crucial role to play in the completion of this project, but your little artist will happily take all the credit when it is fluttering on the porch or in the nursery window. Give the tried-and-true method of making homegrown sun catchers a new interpretation by creating pennant shapes or clip sun-shaped circles to a string for hanging where the colors will catch the light. Suitable for 30 months and up, although you can encourage some fiddling around from younger siblings. Help the older kids to grate crayons, color by color, into small piles of wax shavings. Place colors into individual sections of a clean egg carton. Lay 4-inch wide pieces of waxed paper vertically on a work surface, one at a time. Show the artists how to sprinkle small amounts of crayon shavings on the half of the paper closest to them. Sprinkle with your youngest, or just let a too-small kid scribble on paper with ungrated crayons. Be sure to leave an inch or so of space on the string between each ironed segment. Once you have enough segments to make a banner of pennants, allow the ironed paper to cool and cut each segment into a triangle, point down, with the string running across the top. Have your kids help you pick up the bunting by both ends of the string and tie it in place on a sunny porch or across a window. If you opt for sun-shaped sun catchers, use six-inch square pieces of waxed paper; sprinkle crayon on one; place another piece of waxed paper on top and iron them together. Trim each square into a circle once the wax is cool and the colors have melded together. Clip the circles to a string, with tiny craft clothespins, to make the bunting. Paint brushes are so ordinary. Instead, dip a feather into your favorite colors of tempera paint and experiment with different techniques to create special effects. Feather painting is suitable for 18 months to 3 years. Squeeze paints into small saucers or containers. Old applesauce cups work well. Add a bit of glue to each cup and mix it into the paint to help the paint stick. Dip feathers into the paint and dab, brush, swipe or press paint on the paper. Trail curvy lines of different colors on the paper and use the edge of a feather to make a marble design, by zigzagging the feather through the paints. Add tiny found objects if you wish. Items that work well include acorn caps, flower petals, ribbons, autumn leaves, or the feather itself. Let the paintings dry completely so the objects will stick. 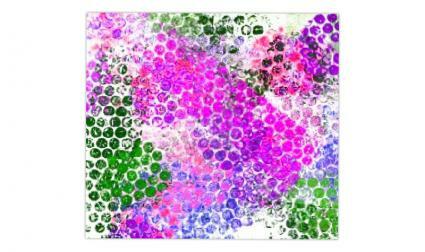 Recycle some old bubble wrap into art prints that take minimum effort and are guaranteed to work. This project is so simple you could do it in your sleep. Kids love to keep printing and printing, so you get a pleasant, no-stress activity, and a lot of homemade wrapping paper. Kids of any age can do this activity, but by age 2, your baby O'Keeffe will really get into it. 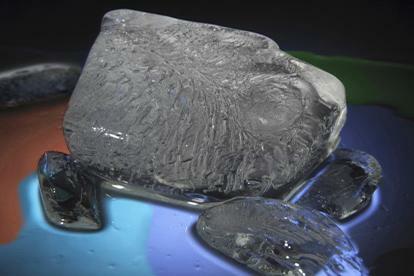 Tape a few pieces of different size bubble wrap, small or large bubbles, to a protected surface. Painter's tape is low-adhesive and easy to remove. Stickier masking tape will hold better. Set out fingerpaints and encourage kids to finger paint the bubble wrap. Show them how to brush it lightly with color but don't get too fussy about random globs of paint. It is after all, their art. Help children to place a piece of light construction paper or white art paper on the painted bubble wrap, tap it gently to impress color on the paper, and then peel it off without blurring the design. Keep experimenting with color combinations and bubble sizes as long as the artists are engaged. Hang the art on an indoor clothesline to dry. Teach your budding Buddhas the meaning of impermanence with disappearing water paint. A chalkboard or a shady patch of the driveway is your canvas. Chalk and plain water are your mediums. Drip and dab or practice letters. Draw a house or an Apatosaurus. It's all good, and none of it lasts. Magic for 2- to 3-year-olds. 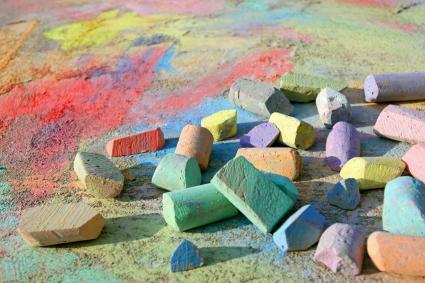 Rub sidewalk chalk over the whole surface of the chalkboard or driveway. You want to cover it completely. Kids can help. Give each child a container of tap water and a couple of paint brushes. Demonstrate how painting with water creates a negative image by washing away the chalk to show the drawing. Guide tiny hands to delicate drips rather than massive sloshes. Let 'er rip. The image lasts as long as there is some chalk surrounding it. You can always move to a different patch of the driveway or dry the chalkboard off and start again. 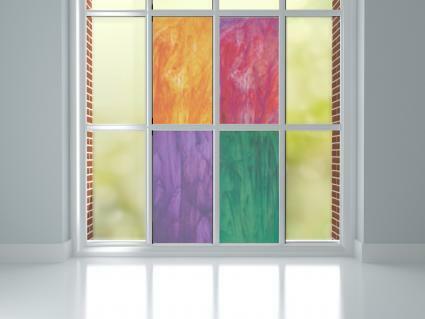 Replace your windows with vivid stained glass the temporary way. Little ones don't need very fine motor control to manage something impressive and lovely. Preschool kids will be more precise and proud of their creations. When the thrill wears off, the art peels off -- and a vinegar-soaked rag has your windows sparkling in a heartbeat. Kids ages 2 to 3 are well-suited for this project. Cut a paper template the size of one mullioned pane of glass, or divide a single-pane window into equal sections with washi tape and make a template. Let kids scribble a free form design on the paper roll or art paper sheets with non-toxic crayons or oil pastels. Place the template over the scribbles and trace individual panes on the paper. Give kids liquid watercolors in small cups, plus one brush per color. Help your exuberant 2-year-old to paint more-or-less on the scribbled paper. Allow the painted paper to dry and cut out the rectangles. Watching colors deepen and slide together is endlessly fascinating to a busy toddler. Playing with ice cubes is mad fun, and making a controlled mess is something both of you can get behind. A cut-down cardboard box, powdered paint and a couple of ice cubes are the start of a great adventure. This activity is ideal for toddlers ages 18 to 24 months, but your 3-year-old may want in on the fun. A large shallow baking pan or a cardboard box cut down to about four to six inches high. Layer a piece of art paper in the bottom of the pan or box and set the box on a flat work surface. The box contains the mess, keeps the ice cube on the paper, and can be tilted and shaken to "create" the painting. Shake some powdered paint on the paper. Vary the colors and use a scant amount, so you end up with a design, not mud. Use colored Jell-O instead of powdered paint if your toddler's hand is quicker than your eye and the art medium could end up in his mouth. When you want to save the last unstained t-shirt and it's time for art class, get out the oversized sandwich bags. A gallon bag is a good size, but you can work with smaller bags, as long as the bags seal with a zipper lock. Roller bag painting is real touchy-feely art that won't redecorate the dining room, the rug or the wardrobe of the artist. 18 months to 3+ years can play. Small wood dowel -- short enough to fit in the bag. Cut out easy paper shapes such as a heart, star, pumpkin, paper snowflake, square or circle. Slip the shape into a large, closable plastic baggie. Squeeze drizzles of bright tempera paint over the shape, inside the bag. Place the short length of a wooden dowel on top of the shape, inside the bag, and zip the bag closed. The dowel takes the place of a paintbrush and adds a level of focus and challenge to the activity. Set the "project" on a generous amount of protective paper where your baby genius can stand or kneel over it to get some traction. Show him how to roll the dowel around, inside the closed bag, so the paint squishes in blobs and shapes over the form. Prepare a couple of baggies and swap them before each one gets too murky. Remove each paper shape carefully, to avoid smearing the artwork, and let it dry. Art activities promote imagination and sensory processing skills. Plus, it's a field in which even the youngest kids excel. Getting into the materials helps with mastering the environment, working on gross and fine motor skills, and developing focus and good hand-eye coordination. The smallest artist is exploring self-expression as she struggles to manipulate those unwieldy fat crayons. When your toddler is finished with her art session, the bath is over, and the results are displayed around the house, your little artist will revel in a tall order of self-esteem, and Grandma will have even more ammunition for the brag book.